Perched on the mouth of the Swan River, this vibrant port city staggers under the weight of cafes, restaurants, bars, museums and other attractions. AT takes a stroll through the maritime treasure chest lovingly known as Freo . 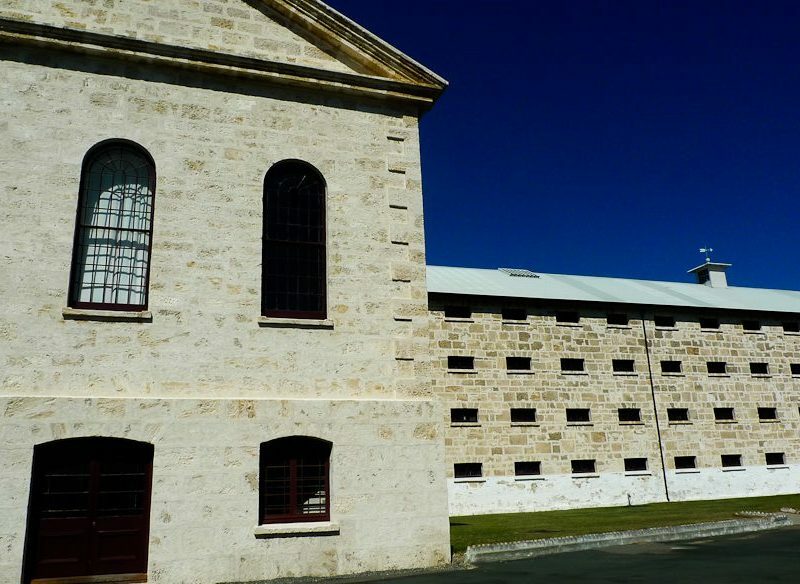 . .
Fremantle Prison is a must-see for most people visiting Freo, but we aren’t sure it’s the best the city has to offer. The tours are run enthusiastically and there’s certainly a lot of history – but this was a prison, so there are very few tales of joy to be heard. Its life as a working gaol for Fremantle ended in 1991, due mainly to the fact that it used a bucket toilet system. Connecting the cells to a sewage system was deemed too expensive, so prisoners were transferred to Casuarina Prison. The 15-acre site was then converted into a museum – and, believe it or not, a business centre. The tours give you a great feel for how life was in this brutal prison. You start in the room new prisoners arrive in, then take in the chapels and various cell blocks. Each holds progressively more dangerous criminals until you reach D Block, where the very worst were kept. To really hammer the experience home, you’re then taken into the execution and solitary confinement cells. A tour highlight would have to be the stunning artwork created by the prisoners. Some of it’s new, some much older. One cell in particular has drawings thought to have been made with a piece of lead in the late 1800s. Painstakingly created and staggeringly intricate, it demonstrates what humans are capable of given very little resources and oodles of time. Ditto some of the Aboriginal artwork. You need a couple of hours for the tour. The Great Escapes Tour, for an extra five bucks, features tales of various escapes. It’s interesting, but having just completed several hours in the prison I found my attention wandering and I began to loathe my chirpy guide. There are also night tours and innovative paddling tours of the tunnels beneath the prison, which are truly unique and highly recommended. AT loves a good museum. Regardless of the quality, you always learn something new. And the Fremantle Maritime Museum looks like an excellent learning experience from the outset. It’s spread across three parts: the New Maritime Museum and Submarine Ovens on Victoria Quay, and the Shipwreck Galleries in Cliff St. There are six good galleries at the New Maritime Museum (The Indian Ocean, Tin Canoe to Australia II, Fremantle and Swan River, Hooked on Fishing, Cargoes, Naval Defence). However, we had some problems. At the time of AT’s visit, there were an overwhelming number of “out of order” or “display under repair” signs, especially in the submarine area, and we were a little disappointed at the level of explanation of some of the exhibits, which contained little by way of background or context info. Perhaps the ecstatic level of build-up was to blame? Either way, if you’ve had a different experience of the Maritime Museum, please share it with us via editor@australiantraveller.com – we’d welcome another point of view. Situated almost next door to the Freo Maritime Museum is a large shed that – for the moment – houses the private motor collection of millionaire Peter Briggs. He’s made available his treasure trove of cars to the public in the form of the excellent Fremantle Motor Museum. As of March 2008, though, the lease for the B-shed has been terminated to make way for a new ferry terminal (ho hum). It remains open for the ’08 summer school holidays, after which time it’s Briggs’ firm hope (since he’s established a presence there over the past five years and all) that he’ll be able to secure another location within the Victoria Quay precinct for his collection. And it’s quite a collection. You have the exotic racing cars, such as that used by Alan Jones when he won the world drivers’ championship, and the car Jackie Stewart drove in the 1970 Grand Prix. Other notables include a mighty Lancia Stratos, vintage racing Jags, the jet-powered Aussie Invader, Australia’s fastest car (pretty much a missile with wheels attached), some beautiful corvettes, a restored 1940s caravan and Paul Hogan’s Ute from Crocodile Dundee. So do yourself a favour; go see this great museum while you still can. You’re familiar with Reg Mombassa, the Mambo guy famous for his crazy artwork? Well, the Little Creatures Brewery looks like the sort of pub he’d have come up with had he chosen architecture over rock ’n’ roll. Part art gallery, part brewery, part library and part pizza restaurant, this is a wonderfully eclectic place to have a beer and a feed. It’s hugely popular and we can understand why. Despite its unashamedly industrial decor the place has a cool, breezy feel and is constantly full of people downing beers and wood-fired pizzas. It’s not fine dining; it’s about enjoying a great beer and relaxing. The staff are über-fashionable young hipsters, but they have such an unpretentious demeanour that you never feel as though you don’t belong there. It’s doing a roaring trade; the restaurant pumps out more than 1000 meals a day. Far from being the shoddy, here-today-gone-tomorrow enterprise its name suggests, the Fly By Night Club is a Freo institution of quite some standing. From the outside it doesn’t look much, but the best bars seldom do. (Ask anyone from Melbourne.) Located near the Freo Markets and opposite Freo Gaol, you’d think you couldn’t miss it. But you can. It’s really just a warehouse with a faded sign. And, as a not-for-profit community musicians club, that makes a kind of sense. Naturally you need to visit at night. In the evenings it’s a delight. In the interests of research, AT went to see US master singer/songwriter Steve Poltz there in January, and while he’s an extraordinary musician it was the venue that really blew us away. Comfortable candlelit tables, all with a clear view of the stage. Plenty of drinks available to tempt the fussiest customers and a great, laidback feel. If there were only more venues on the eastern seaboard like this. Are you Epic? (“The voyeuristic and creative freedom-loving side of your human nature”.) Or Rogue? (“Easy going and laidback, as comfortable in the boardroom as I am around the beach barbeque”.) These names are the first two highly anticipated beers to hit the market from the new Mad Monk Freo range. In the style of Little Creatures, currently the dominant Freo brewery, Mad Monk Freo is a boutique microbrewery that has opened its doors to the high expectations of beer lovers Australia wide. This is no local pub with mates, a beer, and a slap on the pokies; the euro-style café with on-site bakery and small-batch brew house is as much about the food as it is the beverages. Head brewer Richard Moroney is aiming for another 16 different beers in total, with three to be released early in 2008. If you’re more up for jaunting the environmentally friendly way around Freo, ten newly developed walking trails allow you take your time to experience a different perspective of the vibrant WA port city between Fishing Boat Harbour and Victoria Quay. Each walk takes 2-4hrs and you can amble at your own pace, guided by downloadable maps. Soak up the history of the Discovery and Maritime Heritage Trail, celebrate local scribes and poets on the Writers’ Walk, or explore our penal past on the Convict Walk. Finish the day with the Waterfront Walk, pausing only for dinner on a balmy summer Fremantle night. Last-minute weekend items can now be purchased Friday evenings as Fremantle’s late night shopping switches from Thursdays. The launch of Friday night shopping was finally pushed through after a community survey showed 93 percent of people were for the change. With extra bodies expected to be drawn to Fremantle’s Friday night shopping and entertainment, security and parking issues have been addressed. More lighting and CCTV cameras have been added, but the main focus for the new trading times is for Friday nights in Freo to come alive. AT certainly hopes so!